Idiomes: anglès, francès, alemany, castellà, portuguès, italià. 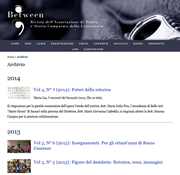 etween is the international, peer-reviewed and open access Journal of the Italian Association for the Theory and Comparative History of Literature - Compalit. The journal is published twice a year.